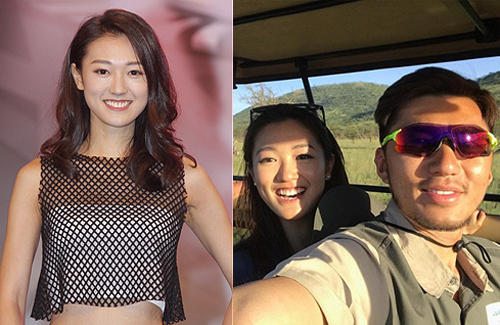 Since breaking up with Jennifer Shum (岑杏賢) last year, Benjamin Yuen (袁偉豪) may finally have a new girlfriend. He is reportedly dating Miss Hong Kong 2016 Bowie Cheung (張寶兒), who won the Miss Friendship award at the pageant. Prior to being romantically linked to Benjamin, Bowie was in a steady relationship with longtime boyfriend, Jonathan. However, not long after celebrating their seventh dating anniversary together last August, Bowie and Jonathan suddenly called off their relationship. Returning to work on the reality show All Work No Pay Holiday <打工捱世界Ⅱ> with her new single status, it was rumored that she quickly hit it off with co-star Benjamin. After concluding filming and flying back to Hong Kong, Bowie and Benjamin were caught going on quiet dinner dates. Some keen reporters even caught Ben and Bowie parking their cars next to each other at the TVB studios despite a near-empty parking lot. Hoping to keep this new budding relationship a secret, it was speculated Benjamin did not want make an official announcement in case the news upset ex-girlfriend, Jennifer. Although Bowie has not confirmed the dating rumors either, the 25-year-old has been glowing ever since filming for All Work No Pay Holiday in Tanzania wrapped up. Bowie also indirectly dropped hints on her social media accounts of her new relationship. Bowie recently posted a throwback photo of her and Benjamin in Tanzania. On her Instagram photo, she wrote, “Every time I look through the photo album, I miss the days spent in Africa.” As well, Bowie recently changed the cover photo for her Facebook account to a picture of her and Benjamin taken during last year’s Miss Hong Kong competition. @myozzie sometimes, I wonder if its his Bazi that has him choosing these types of girls. LOL. Come on Ben, there’s Natalie Tong and Nancy Wu. But then again, Ben always seems to have bad timing with those two in terms of chances of a relationship. Oh well. @gommemorceux I also was just thinking of both of them to be more suited for Ben – more mature and sophisticated. Not some young eager beaver wanting to make it public. Nga Loh, open your eyes and cast your net wider. Oh well just commenting – we are looking at it as an outsider but thats my feel. Wow, casting stones at her already? I don’t follow either of them but is he that great of a catch? His acting is meh. He barely made noise in Walls. Remember how the table was on him when he and Jennifer broke up? Besides, Bowie isn’t bad looking and Benjamin isn’t like world sexiest man material. If anything, his face has been “letting go” recently. @jjwong Agreed. Don’t understand why people have to have an opinion either way – a relationship is agreed upon by two people, not us. Ben is also old – he’s not much of a catch. I did have a slight crush on him years ago, because I thought he was attractive (but his acting needs help). Bowie looks cute to me. I don’t understand why people think the women he dates are unattractive. As long as he likes them, who cares? As a general statement, our society puts too much emphasis on exterior beauty, even though it’s not any sort of accomplishment how good someone looks — just genetics. Maybe look into the person’s personality, and find out what a nice person she is, idk.